A special Bangladesh court on Thursday sentenced former Bangladeshi Prime Minister Begum Khaleda Zia to five years in jail, after she was found guilty in the Zia Orphanage Trust corruption case. According to The Daily Star Bangladesh, her eldest son and Bangladesh Nationalist Party's (BNP) Vice-Chairman Tarique Rahman and four others were sentenced to at least 10 years with a fine of 2.10 crore Bangladeshi takas (Tk). The verdict, given by a special court judge, Mohammad Akhtaruzzaman said that Khaleda's jail term was being kept short due to "her health and social status". She entered the court premises at around 1:40 pm and was accompanied by her BNP supporters and activists. She was also escorted inside the court by the police forces. 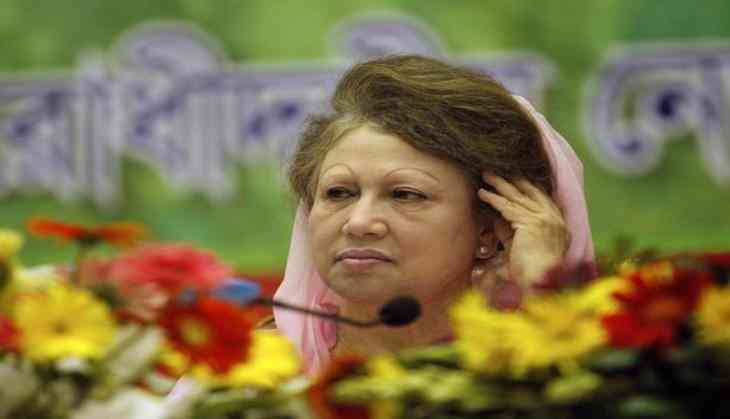 Judge Akhtaruzzaman read a short summary of the 632-page verdict in presence of Khaleda, who was wearing a cream-coloured saree and wearing a scarf and sat on a furnished chair. According to prosecution sources, Khaleda will be kept at the old Dhaka Central Jail at Nazimuddin Road in southern Dhaka. Meanwhile, two others accused in the case were already taken to the special court earlier in the day. The Anti-Corruption Commission filed a case with Ramna Police Station, accusing six persons including Khaleda and her son Tarique. The other accused include- former lawmaker Kazi Salim Haque, businessman Sharfuddin Ahmed, Khaleda's former principal secretary Kamal Uddin Siddiqui and Momenur Rahman, who is the nephew of the BNP's late founder and Khaleda's husband, Ziaur Rahman. Out of them, Kamal and Momenur are still absconding. Prior to the verdict, BNP supporters had clashed with the police, who then fired tear gas shells to disperse the crowd. The Bangladeshi capital had observed a total shutdown, in anticipation of the reaction of the verdict. Security forces were beefed up across the city, including in sensitive areas. According to a report, in July 2008, Bangladesh's Anti-Corruption Commission (ACC) filed the case against six people, including Khaleda and her eldest son Tarique Rahman, for allegedly misusing Tk 2.1 crore that had come as grants for orphans from a foreign bank. Three years later, in addition to this, the anti-graft body accused the BNP leader and three others of misappropriating Tk 3.15 crore from the Zia Charitable Trust Fund, the report said. On March 21, 2014, a Dhaka court framed charges against the six accused. With this verdict, there is a strong possibility that Khaleda might be barred from running for her third term as the Prime Minister in the elections slated for December this year. Khaleda is a two-time Bangladesh Prime Minister, having ruled from 1991-96 and again from 2001-06. In a political career spanning almost four decades, Khaleda went to the jail several times but was never convicted. She was detained several times during the anti-Ershad movement between the 1980s and 1990s. In March 1983, she was made vice-chairperson of BNP after her husband and former Bangladesh President Ziaur was assassinated. She went on to become the party's chairperson in 1984, a position which she holds today. May 10, 1984. Since the last three decades, Bangladeshi politics have been dominated by Zia and current Bangladesh Prime Minister Sheikh Hasina.